When the material is cured and dried, the components, which organize the material, increase their molecular weight through a chemical reaction, called a Chemical Network. The chain molecule moves by thermals and generates a phenomenon called Yarn's Entanglement, and becomes a Physical Network. When fillers, like pigments, are added to the system, the material absorbs the fillers, although absorption depends on the materials. This is called a Physical-Chemical Networks. The effect appears in the form of a molecular increase. When the material is placed on the base plate, material absorption takes place on the base plate and becomes a Physical-Chemical Network. An increase in molecular weight causes an increase in viscosity, and when it is vibrated in a high viscosity solvent, the amplitude of vibration decrease and makes logarithmic damping ratio greater. Therefore, by evaluating the logarithmic damping ratio, the viscosity change caused by the creation of the network can be measured. With the molecular weight, even if it is due to the same network, the viscosity lowers when the temperature rises, and the logarithmic damping ratio becomes small. When the network is created, the size of the network becomes too small. When the size of the network is greater, the pendulum moves a great distance in order to crush or stretch the network. Therefore, the period of time the pendulum swings increases. However, when the network is created and the size of the network decrease, the distance of the pendulum movement shortens. By measuring the frequency, that is the time of pendulum movement, the size of the network due to the cross linking can be measured. Thus, the curing and drying conditions of the materials can be evaluated by analyzing the logarithmic damping ratio and the change of frequency. All materials become a solid state from a liquid state through some action (heat, light, time and others), and produce various physical properties. The change of phase from liquid to solid causes various problems. Due to this fact, there are cases that the expected performance design cannot be achieved and the performance of the material is lowered and changed by some environmental factor in the process. The most important evaluation item among the material evaluations is to pursue the aging change of the chemical-physical performances in the process of curing and drying from a liquid state to a solid state. The instrument developed for this evaluation purpose is a rigid-body pendulum type physical properties testing machine, model RPT-3000W. Simulation can identify the most effective production schedule and the best materials composition for the designed property. 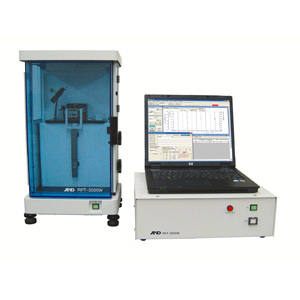 With this instrument, one can evaluate the curing and drying process of organic high polymeric materials, and their bulk physical properties, or evaluate the surface's physical properties and other materials, such as inorganic material like concrete, cosmetics, paper and foods in the operational temperature range from -100 degrees Celsius to 400 degrees Celsius. comes vertically into contact on the test piece coated surface. Apply free vibration to the pendulum. For measurement of physical properties, use a cylindrical edge. By analyzing this vibration, the curing process and surface's physical properties can be evaluated. designing and trouble-shooting production line and life evaluation of materials. Specifications subject to change for improvement without notice. User needs to purchase the following PC and Database software for RPT-3000W. The MSAT series is equipped with functions for not only testing machine operation but also data analysis, calculation and data storage for each testing mode. The operator can select curbing behaviors or physical properties depending on the purpose of the test.